If you're flying into Heathrow International Airport there are a few methods of transport into central London. Trains, coach buses, and taxi cabs are standard options, and which you choose depends on how much you're looking to spend, and how fast you need to get there. Below is our quick guide on the different options including prices and hours of operation, so you can make the best choice to fit your budget and schedule. Jet-lagged tourists and business travelers often opt for the fastest way into the city, the Heathrow Express. The high-speed railway takes you from Heathrow to London’s Paddington Station (smack in the middle of the city) in just 15 minutes. The Heathrow Express costs £20 pounds one-way, £34 return. The Express train runs from 5 am to midnight and a train departs every 15 minutes. 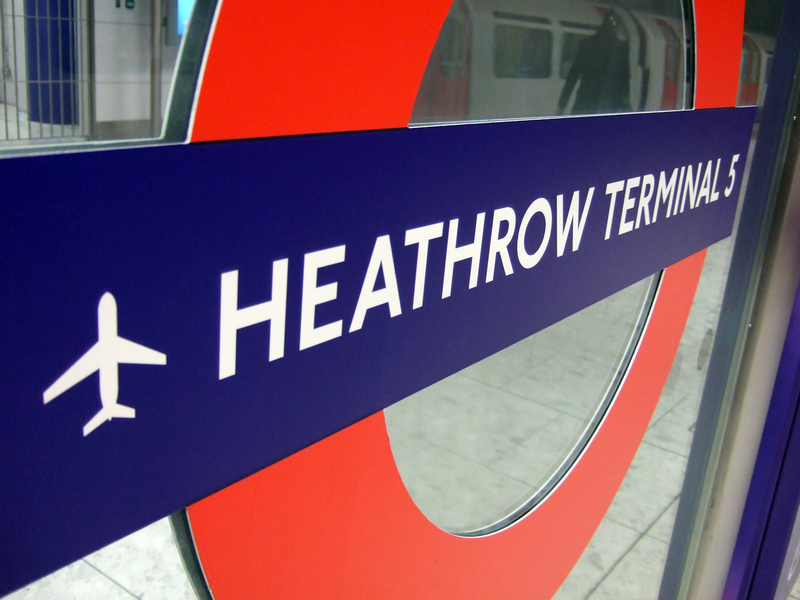 The second fastest method into central London, the Heathrow Connect offers a good balance between cost and time. It takes 25 minutes (10 more than the Express) to get to Paddington station, and departs every 30 minutes. The Heathrow Connect costs £9.50 one-way and £19.00 round-trip and the train runs from 5 am to midnight. The most budget friendly method into the city is London’s Underground. Terminals 1, 2, and 3 are connected by a central station that is a few minutes walk via underground tunnel. Terminal 4 and 5 have stations located in their respective basements. The Underground makes lots of stops along the way so the journey takes 60 minutes to get into central London. The Underground trains depart every 10 minutes and the service runs from 5 am to midnight. The Underground costs £4 one-way and includes a transfer once you arrive in London. You can pay with a travelcard or Oyster (which is your best option) and you can buy your tickets at the automated machines in each station. The Underground is a fantastic and practical option for most people who pack reasonably. For those who don't, well… some of the Underground stations in London are old and only have stairs not escalators—which makes travel during peak hours with a lot of luggage a bit of a nightmare. Of course some stations (including all the airport ones) are perfectly accessible and not a problem to navigate with luggage, but you should research the station you plan on exiting at, or follow our guide on packing light, before you commit to the Underground. National Express offers a coach bus service from Heathrow’s Terminal 1 and 3 to the Victoria Coach Station in London. To get to the National Express Station is a few minute walk from terminal 1 & 3, and there is a free shuttle service from 4 and 5. A coach bus departure every 35 minutes, and it takes about 40-60 minutes to get to the station depending on traffic. Fares start at £5.60, and go up as the coach books up, so book early if you’re taking this route. Service starts at 4:30 am and the last train is at 10 pm. The National Express Coach is a bit more hassle than it's worth in our opinion. Getting to the bus station is just as much work as getting to the underground platform, and you'll likely have to wait longer for a bus to board passengers and depart. Since the coach bus only goes to Victoria Coach Station, you'll probably have to transfer to the underground or hail a taxi at that point, to get to your final destination. You're better off to just take the underground from the airport, which will get you closer to where you want to go. London’s taxi system is expensive, and prone to frequent traffic delays. However, people traveling with a lot of luggage (or on their companies dime) may find it easier to get to the door of their hotel in a cab. You can catch a taxi at the stand located in each terminal, and there are always plenty lined up waiting. The fare to central London usually runs between £45 - £85, and the ride takes about 30-60 minutes, depending on traffic. The taxi fares are based on a tariff system (the meter goes up if the car speed drops below 10.4 mph) so if there's a lot of traffic the fare price will climb slightly.